No doubt these were the smoothest bikes in Cairns today thanks to the pilots and the work done in pre-race set-up by their diligent and experienced mechanics. Specialized earned three World Championship titles today in Cairns. 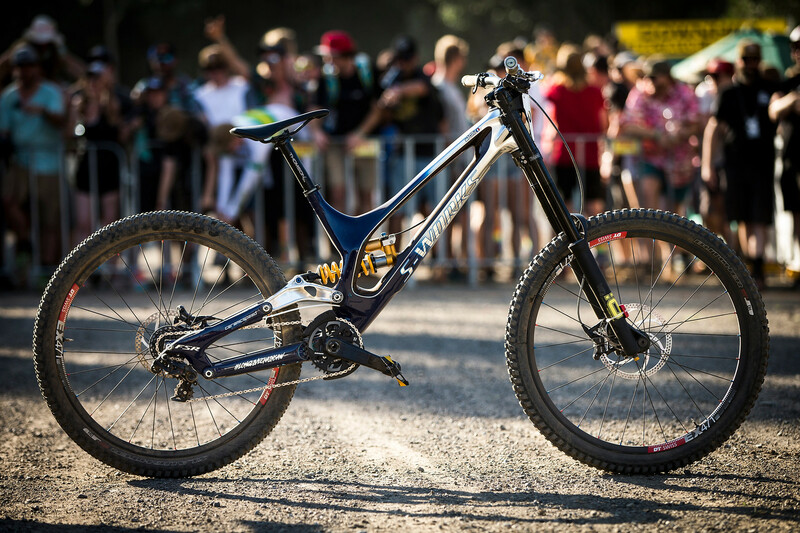 Melanie Chappaz (Junior Women), Miranda Miller (Elite Women) and Loic Bruni (Elite Men) piloted their S-Works Demo rigs to the top of the podium and into the rainbow stripes at World Champs. Dig into the custom painted bikes of Loic Bruni and Miranda Miller. 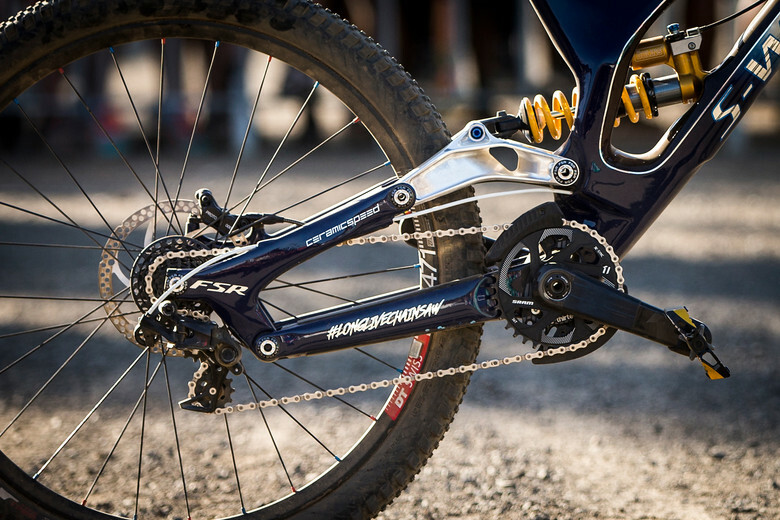 They feature Ohlins suspension front and rear, Formula Cura brakes, DT Swiss wheels, Crank Brothers pedals, e*thirteen chainguides, Specialized tires and SRAM drivetrains (with the logos on the cranks blacked-out). Loic works with his long-time mechanic and suspension guru Jack. They slowly built their way to a winning crescendo of bike setup all week, using their telemetry system for the timed run. That helped them refine suspension settings and tire choice preferences to eek out a win by .33 seconds. Loic ran a Slaughter semi-slick rear to victory just like he did here two years ago. Loic's and his bike have always looked smooth and planted the entire season and they pulled it off today with a win. Miranda Miller, a suprise winner for most, looked fully in-form during her run with smooth, commit lines and a strong finish sprint. She and her mechanic Kevin Kabab (who also wrenches for Finn Iles) worked on set-up until the very end. Kevin remarked that he reminded Miranda of Morgane Charre's World Champs win a few years ago, encouraging to push hard knowing that anything is possible. Miranda made Canada proud today with her victory. 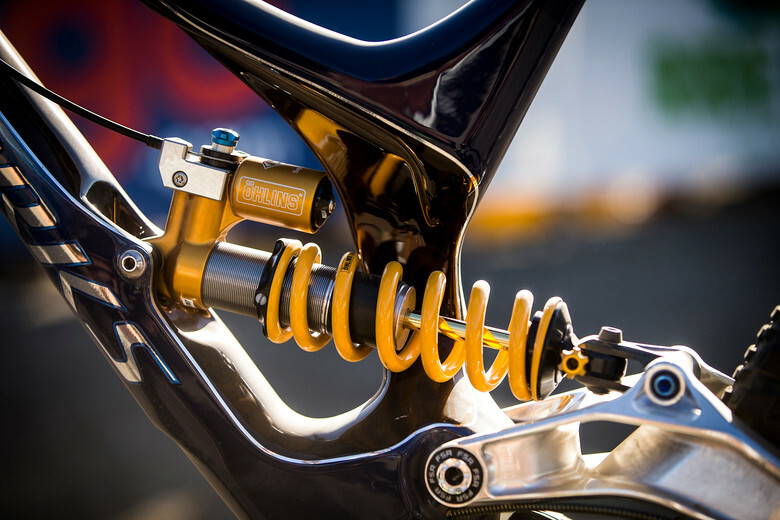 I thought I heard somewhere that the Ohlin dh fork was running something like 220mm or ~9in travel. Can anyone confirm this? 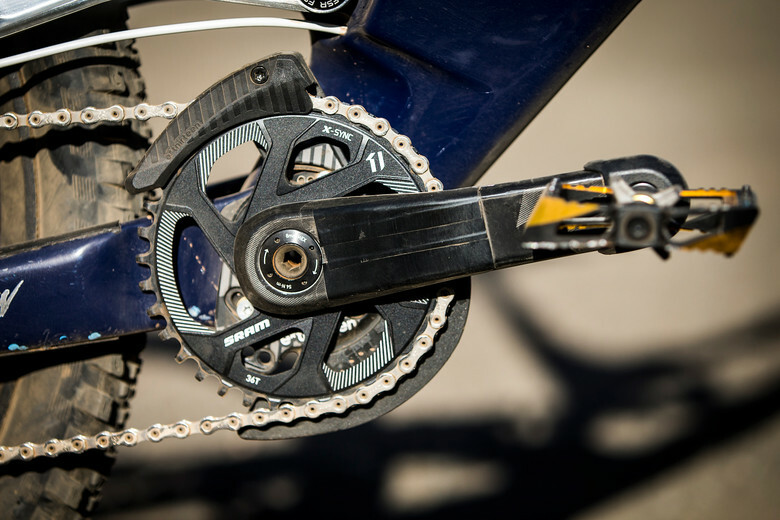 I seem to recall reading somewhere that there was some kind of schism between the two, when spesh switched off rockshox. That's why they also run formula brakes.